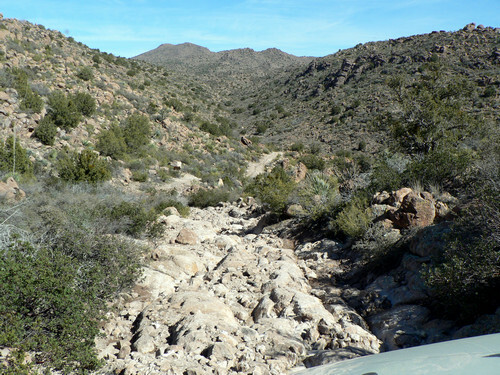 This remote, scenic trail should be done one time by everyone with a well equipped vehicle. It is probably low in the 3.5 rating range, but is very rough through the center portion. It is a long bumpy day, but you will take away good photos and great memories. 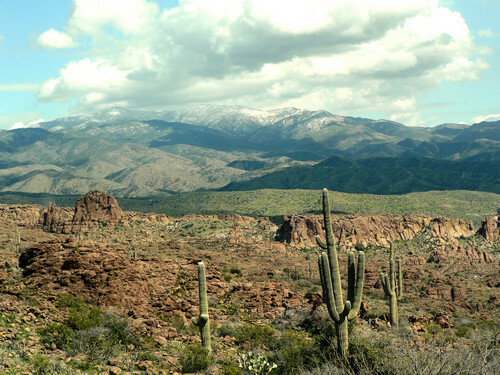 Pinal Peak (right) is a nice vista at about 8,000' elevation. The trail can be run either way but we prefer to do it west to east. Seems to be more scenic. 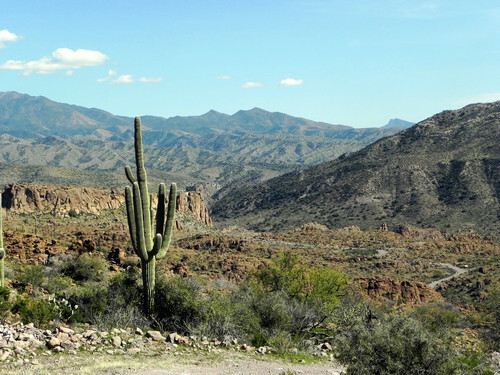 The western end of the trail was graded circa 2010 for exploratory drilling associated with the Resolution Copper mine on the other side of Devil's Canyon. It is beginning to deteriorate, but as of 2015 is not too bad. The eastern end improves from 2.5 to GP. 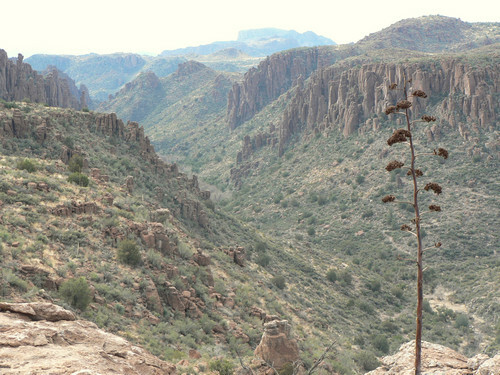 There is a nice overlook into Devil's Canyon not too far into the trail. Shortly after that is where the road gets bumpy. The trail drops down into Mineral Creek at the southern most point of the trail. Great views as you wind down the switchbacks. Almost as soon as you reach Mineral Creek you will turn left up Lyons Creek. At this point you are about 2,900' elevation. 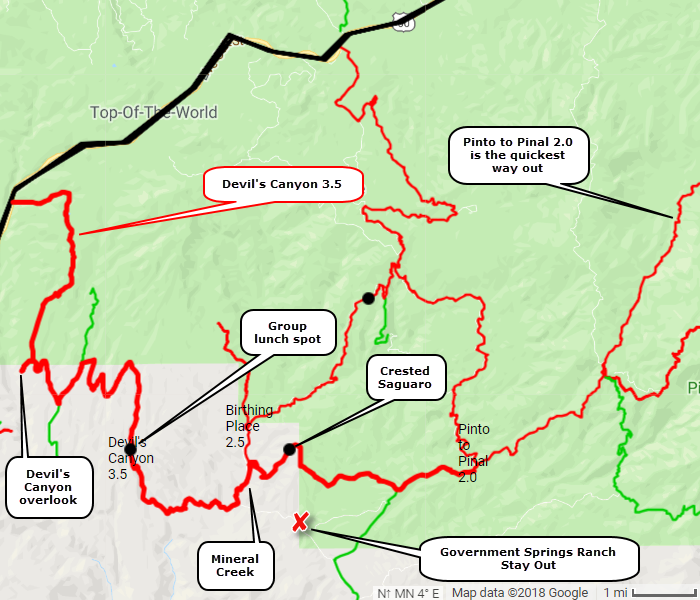 Follow Lyons Creek a short distance then turn right and head for higher ground. 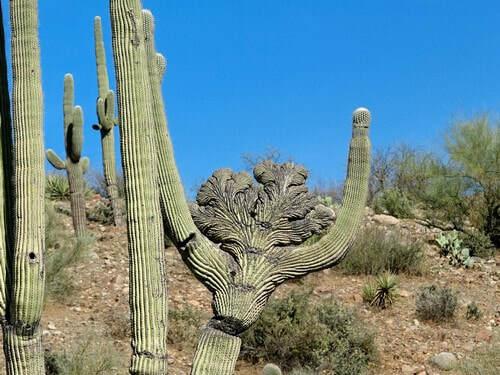 Watch for a crested saguaro on the way up. At 6,000' elevation turn downhill and head for Globe. 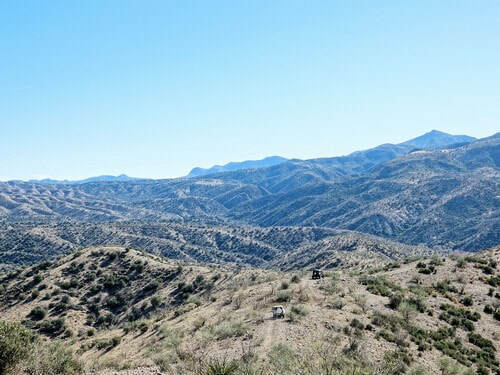 It is possible to turn left when you reach Pinto to Pinal 2.0 and go to US 60 that way, but it is quicker and easier to turn right and go through Globe. Government Springs Ranch has grazing rights along this trail, and they also own some of the land outright. The trail across this privately owned land can be closed at any time. Please respect the Ranch and do not give them a reason to close the trail. Leave gates the way you find them. 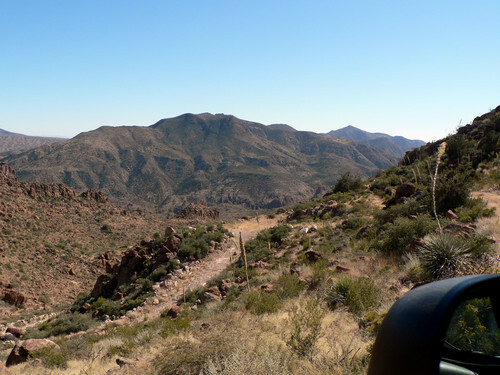 The ranch is not gated from this trail, but the manager does not want traffic through the ranch. Stay away. Updated 2018 for eastern end.